Russia's 1917 Offensive - the Kerensky Offensive - a pencil sketch of a Russian soldier fleeing his trench as Central Power bayonets rise over it. The failed offensive, was Russia's last of the war. By Ger. 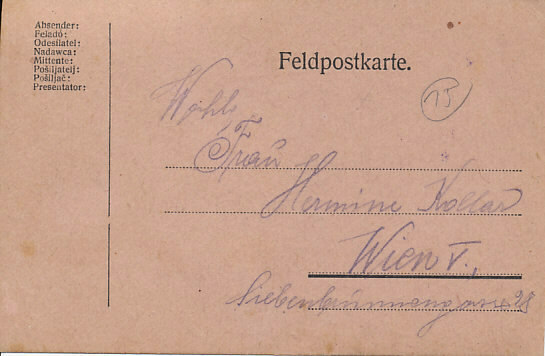 F. Kollar, addressed to Frau Hermine Kollar of Vienna. 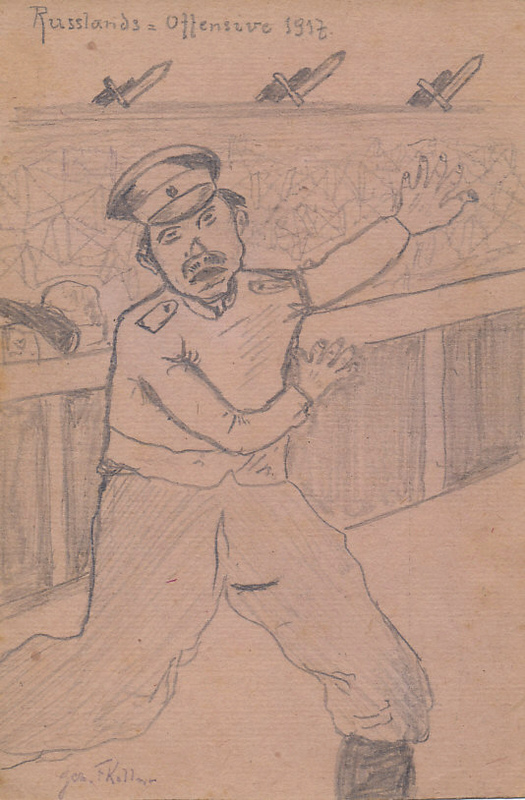 On May 1, Milyukov, the Foreign Minister of Russia's Provisional Government, notified the Allies that Russia recognized its obligations to them, and that she would fight on. Soldiers and other protesters opposed to the war gathered at the Mariinsky Palace, the government seat, to force Milyukov out. In the coming days, their demand was met. The Minister of War resigned and Alexander Kerensky took his place, moving from Justice Minister. Despite the circumstances of his appointment as Minister of War, Kerensky supported the war, and launched his own offensive on July 1, 1917, a drive in Galicia towards the Austro-Hungarian fortress city of Lemberg, under the command of General Alexsei Brusilov, now army chief of staff. The Russians drove back the Austro-Hungarian troops in the first two days of the battle and in a renewed attack on the 6th, but a counter-attack on July 19, 1917 under Generals Bothmer commanding German forces and Kövess leading Austro-Hungarians, defeated the Russians. By August 3, the demoralized Russians were driven from Galicia along a front extending from Poland into Romania with a loss of 200,000 casualties, 40,000 of them killed. The Kerensky Offensive was the last major Russian initiative of the war. The Central Powers were victorious, but Austria-Hungary had reason for concern: some Czech and Slovak POWs, Austro-Hungarian citizens and soldiers, fought alongside the Russians.